If you plan on using a kettlebell instead, do follow our kettlebell workout series for further instructions! Yes4All was started in 2010 as a registered company in California. They are an e-commerce focused company. They sell online only and their product portfolio varies with items of yoga, pet & home appliances. Most of the items they sell look like rebrands from a no-name manufacturer. Yet, they have good reviews in customer service, which is an added benefit while dealing with them. You get a set of 2 dumbbells with a total weight of 60 lbs. There are two 14”x1” handles, four 5-pound plates, four 8-pound plates, and four collars. 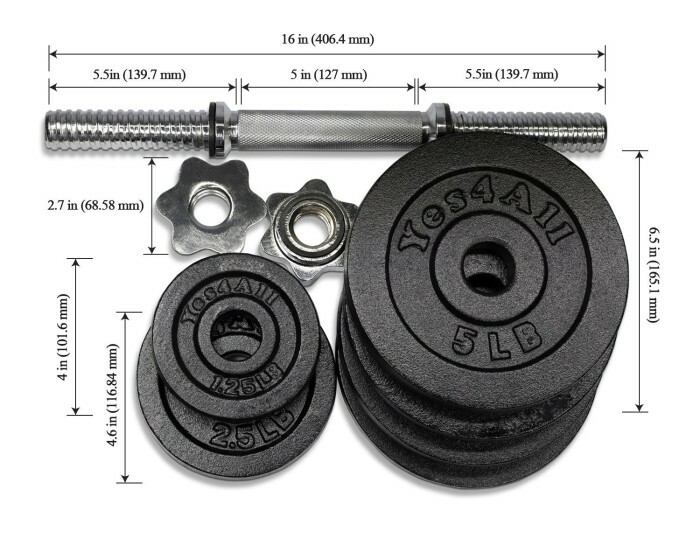 The cast iron weight plates fit 1-inch standard bars. You could use all standard 1-inch handles with these. The cast iron plates are covered with a black paint finish, in order to prevent rust and corrosion. The manufacturer says that they handle is chrome textured for a better grip. There are diamond-like curls present as well, which should help with even better grip. The collars are star-lock collars with loose-resistant rubber trims which have threaded ends, which provide a safe, secure workout and assist with easy weight plate changes. Weight increments: If you buy 60 lbs, you get four five-pound plates and four eight-pound plates. This can vary with the amount of weight you buy. Padding: The handles could have used a little padding, which would have increased the usability. I see a lot of people have praised this product as one of the cheapest products on the market, giving it a value advantage to it. These work great for almost all dumbbell related workouts and are long lasting. These come with a five-year warranty, which is also very good for the price. With such a low price, there is always some compromise to be made in a product. The primary complaint with a lot of people is that the paint that they have used to prevent corrosion is really greasy and comes off really easily. This is partly true, and a user has even provided solutions to this issue with pictures. However, I really haven’t had it come off as much as reviews have suggested. People have also had issues with the screw being too loose. Some people have also suggested that if you tighten these clamps and put actual force into it they will stay put. They also suggested taking out the rubber rings as that helps them stick together. For those of you that cannot put so much force, simply twist the last weight plate next to each clamp right and this will tighten it with little effort. You won’t really be able to find these offline since these are sold online only. However, make sure to check shipping policies in your area. Some people had to go to the post office to pick up their product as there are limits in USPS shipping weight policies. However, as far as pricing goes, these are unbeatable. You can buy 200 lbs weight at $200, which equates to a dollar for a pound of weight. You can’t find anything cheaper than this. I like to use and abuse the products I buy. I am a pretty rough handler of things, and these have so far survived without any major issues. I think that what had sealed this purchase for me is that the price of these are almost perfect. Going to the store and buying weights would have cost me more in gas alone. Free shipping is an added bonus, and these came in about a week. The shape of the dumbbells is not revolutionary. This is what is perfect. These are not trying to innovate. They stick to what is right and what has been used since forever, and they get it right. The handle is a little larger than what you would expect but it is not too heavy. Once you fit the weights in these do not wobble at all. I have had no difficulties in using these pair. The diameter of the handles on this set is 1.25,” while the standard handle diameter and plate hole is 1 inch. The seller’s loose plates are 1 inch as well. 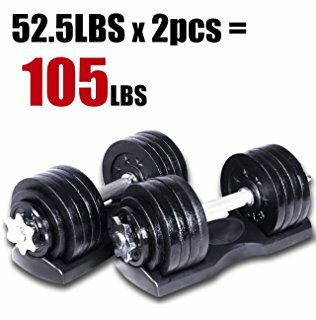 It’s kind of annoying because anybody buying 50 lb dumbbells is obviously looking to get bigger, but once you’re ready to add more weight, you have a difficult time with this particular set. So, if you are looking for something, make sure you have enough weight purchased that will keep you going for a while. 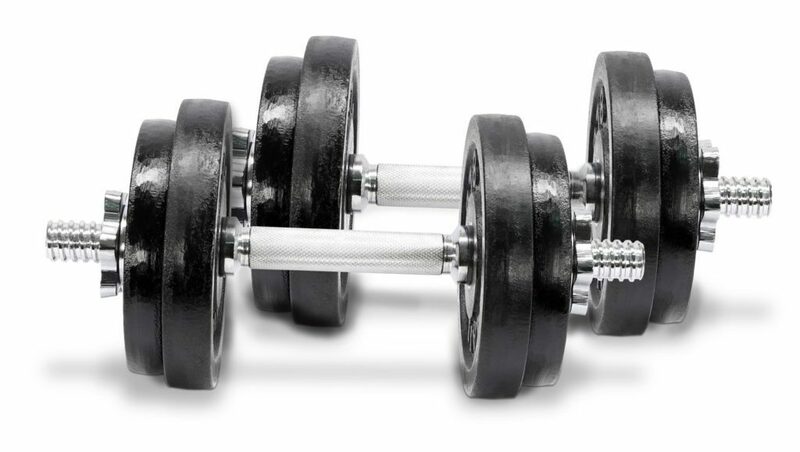 Positives: These are the cheapest set of pair of adjustable dumbbells on the market. If you are a professional lifter or are planning to become one, these are good for training. You also get a five year warranty with this set. Positives: These have a natural shape, which makes it easier to hold and exercise compared to the other power blocks. Once you start using these, your workouts will become much, much faster as you won’t have to bother unscrewing and adding extra weights. These are not going to take up a lot of space in your house. Negatives: This has a high price. The quality could be better for the price. Warranty of two years only.